SALSA VERDE: Preheat oven to 450 degrees. Place tomatillos, onion, jalapeno peppers and 8 cloves garlic on a baking sheet. Drizzle with canola oil and toss lightly to coat. Roast for 30 minutes or until tomatillos are browned in places and juices have run out. Cool to room temperature. 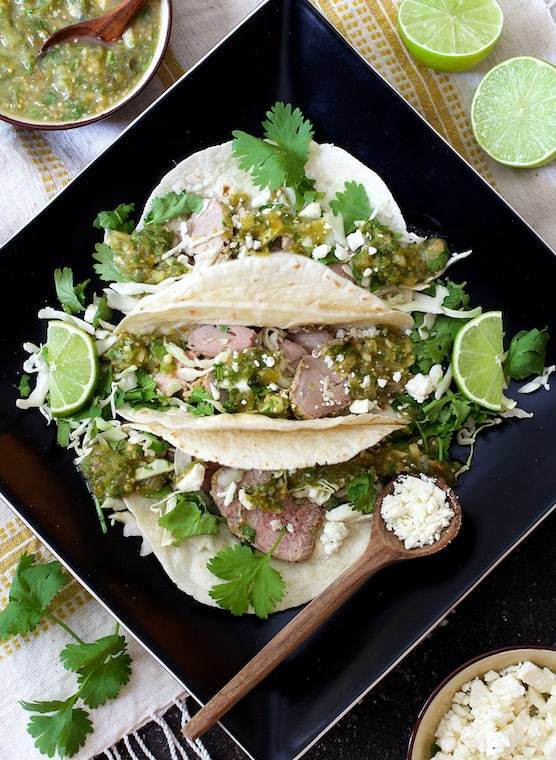 PORK AND TACOS: Combine lime juice, canola oil, garlic, cumin, oregano, salt and black pepper in a zipper-top bag. Add pork tenderloin, squeeze bag so that marinade surrounds pork and refrigerate 2 hours.